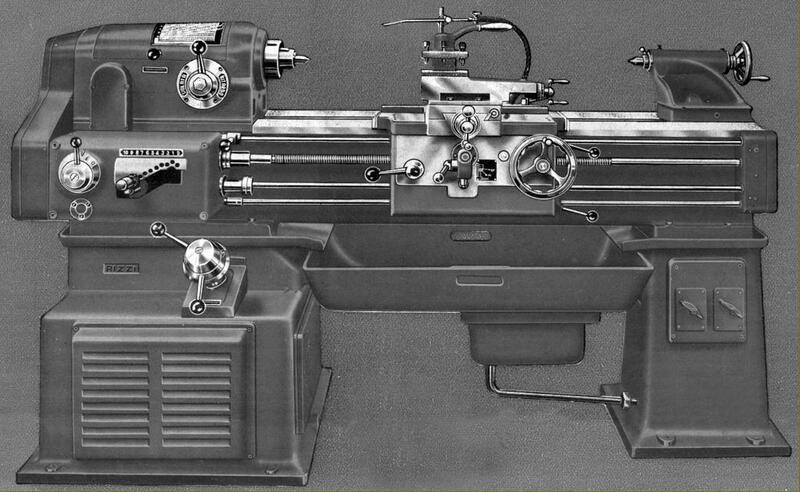 Made in the city of Modena, Italy (home of Ferrari) the 175 mm x 900 mm Rizzi "Volturno" lathe was of conventional design and construction and in production circa 1945 to 1955. Enormously deep, the 1800 mm long straight (gap-less) bed guided used V and flat ways to guide saddle and tailstock - the front V-way being described my the makers as being of the LeBlond Type - a design that had, on occasions, been used by that American Company where, reflecting a fashion of the time the outer part of the way (to better absorb wear) was made much wider and set at a shallower angle than the steeper, shorter inner side that took the tool thrust. The bed was supported on two cast-iron plinths with that at the headstock end holding a 3 h.p. 2-pole 2800 r.p.m. motor and a V-belt-driven 6-speed gearbox containing hardened and ground gears running in an oil bath. Control of speeds was by a pair of levers mounted on concentric shafts and within easy reach of the operator. This type of remote gearbox arrangement, which removed all but the low-speed backgears from within the headstock, was intended both to simply the design and also reduce marks on finely finished surfaces caused by gear thrash induced vibrations. Final drive to the headstock was by a flat belt tensioned by an eccentrically mounted jockey pulley. Running in adjustable bronze bearings (with ball-bearing thrust races), the 700 mm long main spindle was 60 mm in diameter, made from hardened and ground high-tensile steel and bored through to clear 31 mm. The nose was large enough to accommodate a giant No. 5 Morse taper, with a hardened sleeve supplied to reduce this to a No. 3 for between-centres work. In order to avoid belt pull affecting the spindle, the headstock pulley ran in its own roller bearings, the drive being transmitted by a peg. Twelve spindle speeds were available: 30, 42, 60, 85, 120, 165 in the headstock-mounted backgear and 240, 325, 460, 630, 860 and 1200 rpm in open drive. 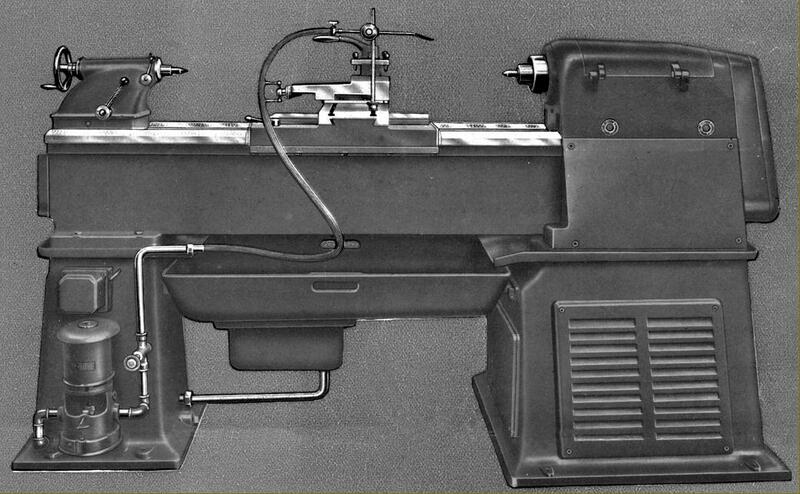 At the tailstock end the stand had the electrical switchgear built into its front face (a dangerously remote location in the event of an emergency) with the rear section used to carry the coolant pump. As part compensation for switch location, the spindle stop, start and reverse was under the control of a "third-rod" system with the operating lever pivoting from the apron's right-hand face. Driving a 30 mm diameter by 6 mm pitch leadscrew that was used exclusively for screwcutting, the Norton type quick-change screwcutting and feeds gearbox contained hardened gears mounted on ball-bearing supported shafts running in an oil bath. The box could generate twenty-four metric pitches from 1.125 to 15 mm pitch; twenty-two English from 0.125 to 0.9375 t.p.i. ; eighteen MOD from 0.5 to 7.5 and thirty-two diametral from 4 to 60. Driven by a separate power shaft fitted at the headstock end with a spring-loaded, safety clutch of the cam type (as often employed on the primary drive of older motorcycles) twenty rates of sliding and surfacing feed were available: the former from 0.043 to 0.76 mm/rev and the latter at half that rate i.e. 0.021 to 0.38 mm/rev. When either the power sliding or surfacing feed was engaged, disengagement could be either through the normal apron-mounted control or, most handily, through a lever positioned just outboard of the screwcutting gearbox and so within easy reach of the operator. Double-walled and sealed, the apron had an oil sump in its base with drive for the power sliding and surfacing feeds being by a slotted, key-carrying powershaft passing through a hardened worm - the wheel part of the assembly being connected to a series of hardened and ground gears. Feeds were selected and engaged by a single lever with the drive passing through torque-limited safety clutches - a second (apron-mounted) lever being provided to reverse the drive. Cast in what was described by the makers as a special high-strength iron, the saddle had plain, equal length wings that allowed the cross slide to sit centrally. The latter unit was fitted with two traverse T-slots that allowed the 360° swivel top slide to be positioned at will and a rear toolpost fitted as well. Top and cross slide feed screws were equipped with thrust bearings and fitted with rather small sized zeroing metric micrometer dials. Carried on a two-part base 220 mm long that could be set-over for the turning of tapers, the tailstock had a 40 mm diameter, 3 Morse taper tailstock spindle with a travel of 160 mm and was locked to the bed by an eccentric cross shaft operated by a captive lever..